I hope you all had a wonderful week and are enjoying your Saturday. I would like to apologize for being pretty absent here on the blog. I have been extremely busy with work and have been going through some changes in my personal life. Hurricane Harvey has caused the entire city of Houston to lag behind, and things are finally starting to get back normal! If you are new to Style in the Afternoon, Dressing Room Diaries is a series I started a few months ago where I share some of the looks I’ve tried on when shopping. I was going through my camera roll and noticed I had a decent amount of dressing room selfies. Seemed like the perfect time for a post! I am a huge believer in the ability to find good-quality pieces at a great price. H&M is one of my favorite stores to find decent quality affordable pieces. I have noticed bright red popping up everywhere! When I spotted this top at H&M, I knew I had to try it out! I initially purchased this top but ended up returning it because I felt the sleeves were a bit too voluminous for me. I also tried on a pair of high-waisted white wide leg pants. I absolutely loved the fit of these. The high waist and waist tie are so flattering. However, I did not purchase because I felt the color was not entirely practical. These pants were a bit too expensive for H&M. I don’t think they are worth the higher price point. If these came in black or khaki, I probably would have purchased! Of course I made a stop in Forever21 (more like several stops). I tried on a pair of high waisted jeans and this velvet crop top. Velvet is still super on trend, and I am constantly on the hunt for the perfect velvet piece. While I love the color of this top, I felt it was a tad too cropped. The rise on these jeans was perfect, but I found them too long and the denim too stiff. I’m obsessed with swing dresses. They can be dressed up with block heels or dressed down with a pair of cute flats. They are also the perfect transition piece. Just add a cardigan and this dress is perfect for fall. 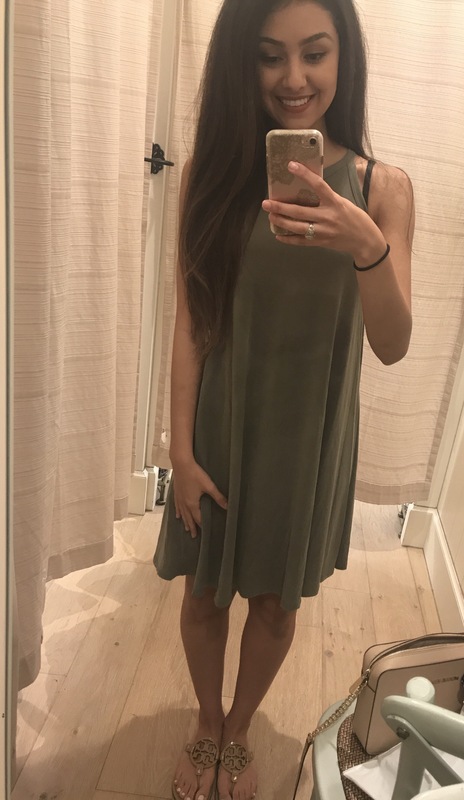 The material of this dress from Francesca’s is so soft and I love the olive color! I did indeed purchase this dress! 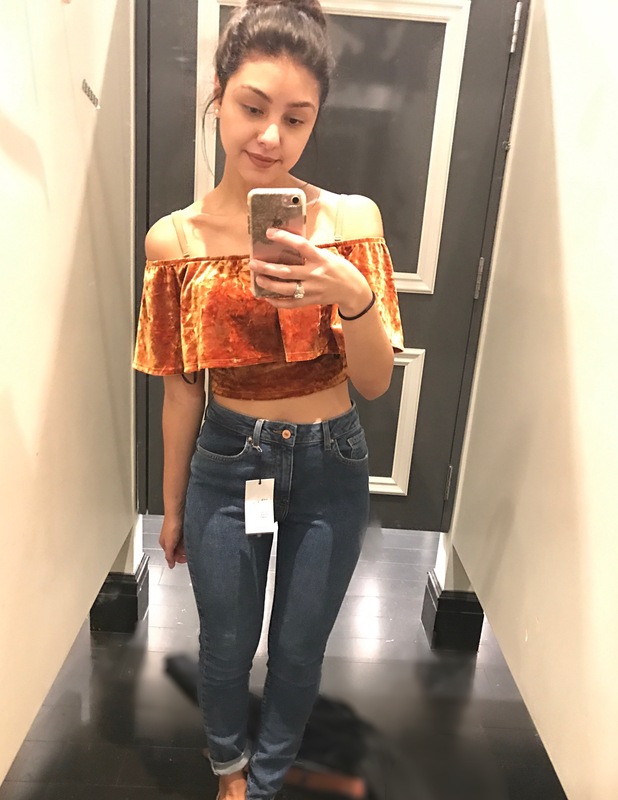 I tried on this adorable rust colored top from express. The color is perfect for fall and the puff sleeve detail is so fun! I did not purchase this because I found the sleeves a tad too long, but I kind of want to go back and get it! As always, I have linked all of the items (if I could find them online) in case you would like to check them out for yourselves. Please feel free to leave me a comment and let me know if you liked any of these pieces or if you have any recommendations for stores to find affordable fall clothing. I plan to be much more active on the blog in the coming months. I have some exciting outfit posts coming up, so stay tuned! I love that top from Forever 21, the color is so pretty and autumnal! Great outfits Nat! I love the last two outfits the best!!! Very cool outfits my dear! The last one is one of my favorites! The Express top looks great on you. It’s now on sale so I say go for it! Thank you! I’m obsessed with the color. I will most likely be placing an express order! ooo really love that first red top! The sleeves are awesome! That velvet top looks so good on you!